​The Gaden Shartse tours have been visiting the United States since 1989 with a two-fold mission: to be of service to the world by helping to spread peace, compassion, and tolerance through cultural exchange, interfaith dialog, and Buddhist teachings while also raising funds to support the education, medical needs, housing, and building maintenance for the Monks at Gaden Shartse Monastery, located in a Tibetan Refugee Settlement near Mundgod in South India. ​Gaden Shartse Monastic College is situated amid lush green hills and jungle in the remote countryside of southern India. It was founded in 1969 as an effort to re­-establish one of the great monastic traditions of Tibet. A small group of elder monks and fifteen young boys, all of whom had managed to escape the destruction in Tibet, settled on land given to them by the Indian government in Mundgod, Karnataka. Today the college is at the forefront of the revival of Tibetan Monastic education, with thousands of resident students, teachers, scholars, and spiritual practitioners. More than 70% of the members are between the ages of 10 and 25 and 80% of these were born in Tibet. To this day, young monks arrive at the Monastery weekly from Tibet, seeking shelter and education. Due to the success of the academic program and the quality of the teachers at the monastery, Gaden Shartse has established a reputation as being the leader in the field of Buddhist and Tibetan studies. Gaden was originally founded in Tibet by Tsongkhapa (1357 - 1419), the great preacher, saint and indigenous Tibetan Buddhist scholar. In the year 1409, Tsongkhapa established Gaden Monastery and consequently the Gelugpa School or the yellow hat (as said by Chinese) section of the Tibetan Buddhism arised. Prophesies of occurrence of Tsongkhapa was done by both Buddha Shakyamuni and Guru Padmasambhava. During the time of Buddha Shakyamuni, Tsongkhapa was a young Lichavi boy, who offered a crystal rosary to Buddha and in return received a conch shell from the Buddha. Buddha then told to his attendent Ananda "in distant future this boy would be born in north and establish great monastery named Gaden".Tsongkhapa is well known emanation of Manjushri (embodiment of the wisdom of all Buddhas), Avalokiteshvara (embodiment of compassion of all Buddhas) and Vajrapani (embodiment of power of all Buddhas). The conch shell was later unearthed from the location of Gaden monastery. But it was given to the founder of Drepung monastery as an auspicious gift by Tsongkhapa. Gaden Monastery is one of the three most renowned monasteries of Tibet. It was magnificently built on a large mountain, calm, peaceful and highly suitable place for spiritual development. The monastery is located at approximately 50 kilometers east of the city of Lhasa the capital of Tibet. There are two colleges in Gaden monastery the Shartse and Jangtse. Gaden was known to have a population of more than 3,300 monks during early years of 1900. Later in 1950's the population of the monastery grew up to 5,000. Gaden quickly became well-known for its moral discipline, academic & spiritual values. Monks poured in from every part of Tibet, Mongolia, China, Japan and Northern India. Though monks came from all ages, the youngest monks started at age seven.Regardless of special focus on specific studies, all monks engaged in rigorous study programs of the monastery for many years. In addition to vast philosophical study, there were trainings in different vocations; religious music, arts, sculpture, and administrative work etc. In both colleges Shartse and Jangtse, Buddhist Sutra and Tantra are taught and practiced in a combined program. That contrasts with many other Gelug monasteries, where study of Sutra and Tantra are kept separately. Thus a monk learn in Gaden means knowledgeable in both field of Sutra and Tantra. In 1950's the People's Liberation Army of China invaded and occupied Tibet. In 1959 His Holiness the 14th Dalai Lama was forced to escape to India for safety of himself and Tibetan people. India, with deep kindness, offered Tibetans safe place to live and keep their culture and religion intact. Over hundred thousand Tibetans followed His Holiness the Dalai Lama into exile and are now living in India, Nepal and Bhutan. During the period of transition, education for the children became priority of the Exiled Tibetan Government and schools were quickly established. Many elder Tibetans perceived, in majority of these new schools, curriculum was strongly influenced by Indian style of education thus comprehensive Tibetan education was unintentionally ignored. This problem was compounded by the fact that the Cultural Revolution was puposely destroying all centers of Tibetan culture and education insideTibet. These conditions led some senior monks originated from Gaden to pool their efforts together. Under wise guidance of His Holiness Dalai Lama, with support from the Indian Government and modest contributions from fellow Tibetans, they re-establish Gaden Monastery in South India, solely to revive Tibetan education, culture and pure Buddhist teachings. Beginning of Gaden Monastery in India was very difficult due to the dramatic climate differences from Tibet and severe heat. In spite of all the hardships, in 1970 Gaden Shartse was formed by 85 refugee monks near the remote village of Mundgod, in the state of Karnataka, South India. The first members of Gaden Shartse settled in the refugee camps of Mundgod, a night's drive from the City of Bangalore. Initially tents were provided through donations and the monks put together a bamboo thatch structure to serve as common hall. In that humble structure they prayed, studied, debated, ate and slept. Many monks died of sickness and exhaustion. With trial and error, they learned to adjust to the new environment and were able to make modest living by cultivating the land provided to them. Over the time of four decades, population of the Shartse increased to more than 1200 monks, including resident scholar, writers, administrators and students from different parts of the world; Tibet, India, Bhutan, Nepal, Taiwan, Europe and U.S.A. Gradually, educational programs began to demonstrate sustained growth and success. Admission, instruction and accommodations were provided free of cost. Preference was always given to children who were either orphans or from very poor families. However, being located at refugee community in a developing nation and with constantly growing number of students, we are still struggling to provide good basic facilities, healthcare and other essential necessities to our students and teachers. Day starts at 6:00am when all the monks meet together at the assembly hall for the morning prayers and pujas. Monks take their breakfast at 6:30am. Then monks attend their daily classes until 11:00am and they take a lunch break for few hours. In the afternoon the junior students spend their time in the school, while senior students attend private teachings given by the assigned teachers. Dinner is served at 5:00pm. The daily debate session begins around 6.30pm and lasts until 10:30 pm, except Monday which is weekly holiday in the monastery. Most of the graduated elder monks spend most of their time in teaching students, doing spiritual practices, social and spiritual works to help public, doing administration or research in various fields of Buddhist teachings. 1. To preserve, diffuse and propagate the teachings of Gautama the Buddha all over the world. 2. Highly qualified buddhist monks teachers to spread real message of Buddha. 3. To enhance brotherhood amid different religious traditions of world through love, care and kindness. 4. To retain the pure teachings of Tsongkhapa with special focus on tradition passed through generations of scholars at Gaden Shartse. 5. To spread precious teachings of great Tsongkhapa all over the world to benefit all sentient beings. By the beginning of the 7th century Tibet was filled with fragmented tribal, war‑loving people. When Tsong Tsen Gampo (617‑693AD) became the ruler of Tibet, he imported the philosophical tradition of Buddhism, which had been flourishing in India for centuries. His successor, Trisung Detsen, then made it the official religion. The once‑violent nation of Tibet became transformed by this new appreciation for the depth and true worth of human life. It was evolutionary. Tibet became one of the finest civilizations the world has ever seen. It became a nation of people filled with patience, tolerance, generosity, love for learning, and loving‑kindness. Monasteries and learning centers sprang up across the country, and the Buddhist values of compassion and wisdom infused the people of Tibet. Sadly, this unique, one‑of‑a‑kind, beautiful civilization was destroyed in 1959 by the invasion of China. The Chinese Cultural Revolution took the lives of more than 1.2 million Tibetans between the years of 1959 and 1972. 6000 centers of Tibetan culture and religion were destroyed. As a result, Tibetans continue to this day to seek‑refuge across the globe. An entire generation has now passed, and sadly the difficulties continue for the people of Tibet. Religious freedom is restrained under Chinese rule, and most of the sacred institutions have been destroyed or shut down. Families are separated as many seek refuge from the repression and occupation of Chinese rule. China uses Tibet's high altitude for the storage and stockpiling of sensitive armaments, putting the lives of the Tibetan people (who do not believe in the weapons of war) at the highest risk, as well as that of the whole of the Asian continent . There continues to be a massive population transfer into Tibet from mainland China, and even the Chinese are resentful as they are unable to acclimatize to the thin air at 15,000 feet. Bigotry and tension are tangible. The suffering thus continues -- only this time, it is rarely heard about. As Tibetan elders, the last to remember the beauty and harmony of a civilization governed by wisdom and ruled by compassion, pass away, younger Tibetans watch their dreams of a revival of this culture slip away. The democratic exiled Tibetan government is located in Dharamsala, India. Maintaining their commitment of non‑violence, the government has trouble negotiating with the Chinese, who refuse to meet with the Dalai Lama. Recently, however, envoys have been received in China, and this is a positive step forward. Still Tibet has had no formal recognition from any government in the world. Tibet’s host, the Indian government, concerned about the reaction of their Chinese neighbors, discourages and dampens the effect of any political action taken by the exile community. In order to support the exiled government's efforts to preserve the cultural legacy of Tibet and its people, the last surviving members of Tibet's former centers of learning have re‑established themselves in India. Focusing upon the survival of a culture and people who face extermination, these monasteries and institutions are the only hope for assuring the continuation of the teachings of this rare and valuable way of existence. One of the first such voluntary centers is the Gaden Shartse Monastic College, which was founded in a Tibetan agricultural settlement in South India. Gaden Shartse Monastic College (popularly known as "Shartse") was originally founded in Tibet in the 15th century. After the invasion of Tibet by the Chinese in 1949, 48 surviving members of the College fled south across the border into India. There they settled in army tents in a remote jungle area that was about a night's journey from the city of Mysore. Slowly they built a mud and bamboo thatched dwelling in which the monks ate, slept, studied, debated, and prayed together. Many died from sickness and exhaustion; others survived but remained ill and bedridden. Those who survived became very resourceful, teaching themselves how to farm the land by means of trial and error. In 1972, three years after settling, their fields were green with their first successful crops. Fifteen Tibetan children from the local Tibetan refugee camp enrolled in the newly founded monastery, funded by the selling of the produce. A simple everyday routine was set up, combining education with physical labor. A rudimentary teaching staff of Tibetans, well‑versed in history and Buddhist teachings, was established. In‑depth education in all aspects of Buddhist philosophy and practice is the focal point of the academic program at Shartse. The duration of the monastic program is 24 years. The students interact with their teachers on a daily basis. Accommodation, food, and instruction are all free and are provided by the monastic administration. Shartse offers complete basic courses in Tibetan History, Literature, Poetry, Grammar, English, and Mathematics, which are studied as prerequisites for the more advanced courses of Elementary Dialectics, Buddhist Logic, the Prajnaparamita (the study of Wisdom/ the Heart Sutra), Madhyamika Philosophy, Vinaya (Ethics), and Abidharma (Epistemology). 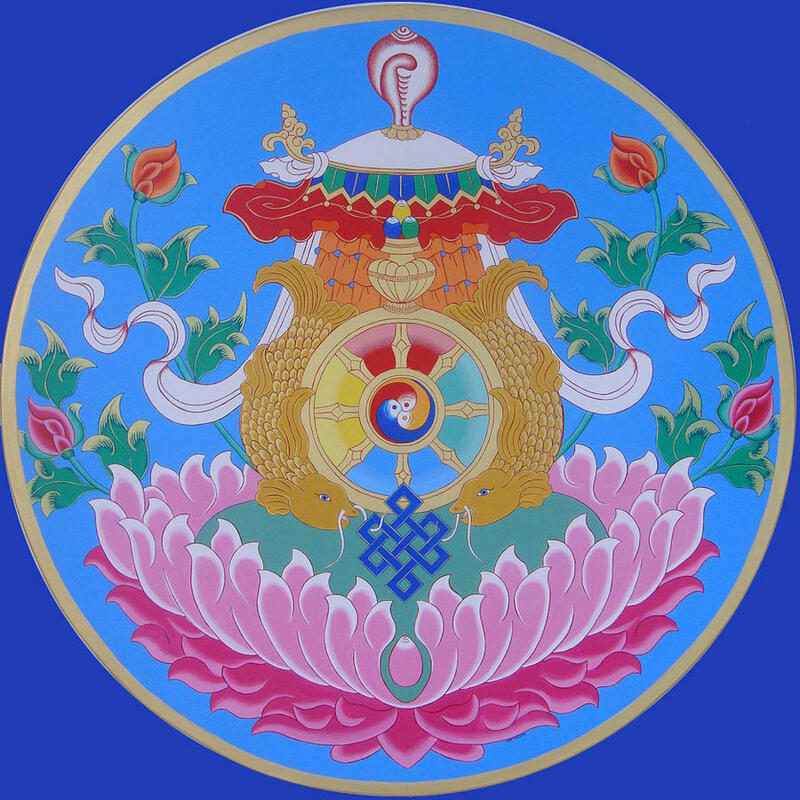 Unique to Shartse is the compulsory study of Buddhist Tantra. Additionally, there are optional subjects such as Painting, Calligraphy, Tailoring, Tibetan Butter Sculpture formation, and Sand mandala creation. The training program also encourages its students to independently pursue and practice profound Buddhist rituals and to complete extensive solitary retreats. The Monastery hosts multiple festivals, seminars and inter-monastic philosophical meetings. Shartse has a staff of twenty, sixteen of whom are teachers and four of whom oversee the proper administration of the programs. Aside from the two English language and mathematics teachers who are recruited from outside the Monastery, every member of the staff has graduated from the Monastery. They teach an average of seven hours a day and offer private instruction from their own living quarters. For more than twenty years they have provided this service free of charge. Only recently did the New Educational Development Project begin to offer them a token remuneration of the equivalent of US $4.00 each month. Teachers play a very special role in the lives of their students. As is the Tibetan tradition, and also due to the early age at which many youths leave their families to join the Monastery, students admire and respect their teachers as they would their parents. Teachers are considered to be the source of both the academic and the spiritual development of their students. Following the democratic constitution promulgated by His Holiness the Dalai Lama in 1964, all Tibetan institutions now function as parts of a democratic government. Although privately administered, the College is also administered on an election basis. There are eight board members who are elected as directors every three years. The President of the College, however, is appointed directly by the Office of His Holiness the Dalai Lama, as was done in pre‑invasion Tibet. 1.White conch represents the beautiful and melodious sound of the Buddha’s teaching, which awakens the disciples from the deep slumber of ignorance and put them on the right course of learning the Dharma and to work for the welfare of others. 2.Precious parasol, also known as the sacred umbrella symbolizes that it protects and shields one from all sources of sufferings and gives comfort under its shade. 3.Victory banner represents the victory over all sorts of obstacles and negativities. 4.Golden fish pair represents the state of fearlessness of all the beings without danger of drowning in the ocean of suffering, just like fish can happily survive in ocean. 5.Dharma wheel symbolizes the importance of turning the precious wheel of Buddha’s teachings in order to attain wellbeing for all. 6.Endless knot signifies the interdependence of the religious doctrine and secular affairs, as well as the union of wisdom and method. 7.Lotus flower represents the complete purification of body, speech and mind from all the negative elements, and let them blossom like lotus. Gaden Shartse Thoesam Norling Monastery has three sizes of “Khangtsen” or dormitories namely ; big, medium and small. Before 1959, there were about 500 monks living and studying in one of the largest Khangtsen called Phukhang Khangtsen. According to the monastic system, new monks who came from far away will join the Nangsang and Yara section in the Phukhang Khangtsen while monks who came from nearby places will join the Phakchoe, Lopa and Shesung section in the Phukhang Khangsten. Statistics showed that every year, 50 new monks will join the Phukhang Khangtsen. When new monks join Phukhang Khangtsen, they will first be taken to the Khangtsen Master where they will start their life as a new member of the “family”. With the reestablishment of the Gaden Monastery in Mundgod, South India, Phukhang Khangtsen came into existence under the Gaden Shartse Thoesam Norling Monastery. Phukhang Khangtsen has a good reputation of many great lamas, teachers and students coming from it. His Holiness Gaden Thripa (Golden throne holder of the Geluk sect.) also teacher of His Holiness the 14th Dalai Lama, some of the past and present Abbots of Gaden Shartse Thoesam Norling Monastery are from Phukhang Khangtsen. Currently, there are about 450 monks living in the over crowded quarters of Phukhang Khangtsen. These monks follow a very strict monastic education which last for 17 years. Besides their studies, they are also involved in doing prayers or pujas. For example, in the second month of the Tibetan calendar each year, there is a grand offering prayer to the Dharma Protector, the four-armed Mahakala. The main purpose of this prayer is to bring peace and happiness to all beings across the globe. being built to house the displaced monks of the Phukhung Khangtsen. Thank you for all of the efforts provided by all who were involved in this and past tours. We are truly blessed and fortunate to have their influence in our community and lives. Thank you to all monks and nuns who have taken time away from their monastic duties to share your lives with the west. The purpose of touring monks is to share with all people the monks’ culture, as well as practices and paths to inner peace and compassion. Donations raised by past tours support much needed building improvements, medical needs, teachers’ salaries and the day to day expenses of supporting the khangtsen. The tour's success is due to the help and generosity of those who support the tours.